Crappie are a fine table fare that can be eaten by all at least once a week. What pollutants build up in Wisconsin´s fish and what is being done about it? Why should I be concerned about pollutants in fish and how long do they stay in my body? Can I remove pollutants from my fish by cleaning and cooking? Are fish bought from grocers contaminated too? How about fish from restaurants? What fish have been tested? Can I swim in waters with an advisory? Can I eat fish from water with blue-green algae? Are fish with parasites and diseases harmful to eat? Where is the statewide advisory not the default advice? Mercury and polychlorinated biphenyls (PCBs) are the main pollutants that build up in fish from Wisconsin’s waters. Because these pollutants may adversely affect your health, recommendations or advice is issued by health officials on how much fish may be safely eaten. In addition, contaminants like dioxin and perflourooctane sulfonate (PFOS) require fish consumption advice at a few locations. Other contaminants, like DDT and dieldrin, have declined since earlier years and no longer require consumption advice to be issued. PCBs and mercury differ in where they come from, how they accumulate in fish and how they affect human health. High concentrations of PCBs are most often associated with industrialized river systems and the Great Lakes. PCBs are a group of man-made chemicals that were used in a variety of industries, in carbonless copy paper and electrical transformers and in cutting oils and hydraulic fluids. Manufacture of PCBs was banned in the US in 1977. PCBs remain in the environment because they are resistant to breakdown. Where PCBs were discharged, PCBs cling to sediments and, like mercury, also build up in fish and animals and birds that eat fish. PCBs reach higher concentrations in older, longer lived, fattier species of fish, like carp and great lakes trout and salmon. Mercury is an element that occurs in rocks and soils naturally. Mercury is released to the atmosphere when power plants burn coal, from some chemical manufacturing plants and incinerators and when mercury containing products are not disposed of properly. When mercury is released into the air, it can travel long distances and be deposited on land and directly into water. Mercury is changed to a form, methylmercury, which builds up in fish and the animals and birds that eat fish. Mercury reaches higher concentrations in long-lived species and predatory types of fish that eat other fish, like walleye. While mercury is found in fish from most waters of the state, high mercury concentrations are most typically found in acidic, darkly stained lakes of northern Wisconsin. These pollutants also can build up in people who eat fish. You can prevent mercury from building up in your body by choosing species of fish with low mercury concentrations and spacing your fish meals out. Your body and eliminate some mercury slowly over time. In comparison, PCBs are stored in body fat and remain there for many years. Because PCBs build up in your body over time, it's important to reduce your lifetime exposure to PCBs by avoiding fish from locations with high concentrations of PCBs. Wisconsin has taken many actions to reduce mercury emissions and to clean up PCBs which remain in sediments of some waters of the states. For further information, please see mercury or sediment management. Health experts encourage us to include fish in our diets but to follow the fish consumption advice. The health risks from eating fish depend on how often you eat it and the contaminant levels in the fish that you eat. People who frequently eat fish high in contaminants, like mercury and PCB’s, can accumulate levels that may harm their health. Mercury from the fish you eat can build up and reach levels that affect the nervous system. Infants and children of women who have eaten a lot of contaminated fish may have lifelong changes in brain function affecting learning, coordination and reaction times. In adults and older children, mercury can affect cognitive thinking, coordination, balance, vision, hearing and speech. Some studies have also found higher rates of heart disease in men who had elevated mercury levels. It takes our bodies about 60 days to eliminate half of the mercury ingested, so fish with higher mercury concentrations should be eaten less frequently. The health effects of eating fish contaminated with PCBs have been widely studied in animals and humans. Studies indicate that people exposed to PCBs are at greater risk for a variety of health problems. PCBs can cause developmental disorders in children born to mothers who eat contaminated fish before and during pregnancy. PCB exposure may cause reduced birth weights and conception problems. PCBs also are linked to an increased cancer risk, as well as immune and endocrine problems such as diabetes and thyroid problems. PCBs are stored in body fat for years and the burden in the body increases over time as one eats more contaminated fish. The Wisconsin Departments of Natural Resources and Wisconsin Department of Health Services provide information about the number of meals and species of fish you can safely eat. By following the recommendations, known as fish consumption advice, you can obtain the health benefits of eating fish while reducing your exposure to these pollutants. Fortunately you can reduce (not eliminate) the amount of PCBs in a fish meal by properly trimming, skinning and cooking your catch to reduce fatty tissue. Cooking does not destroy PCBs but heat from cooking melts some of the fat in fish and allows some of the contaminated fat to drop away. Broil, grill or bake the trimmed, skinned fish on a rack so the fat drips away. Do not use the drippings to prepare sauce or gravies. Mercury accumulates throughout the fish, including the part that you eat. Therefore, trimming, skinning and cooking do not reduce mercury levels in fish. You can reduce your mercury intake by eating small fish, choosing fish species that have less mercury and avoiding some species from lakes where higher concentrations of mercury have been found. Most ocean fish you'll find at the store - species such as pollock, shrimp and salmon - have very low levels of mercury. Some ocean fish do have high concentrations of mercury. The U.S. Food and Drug Administration - FDA [exit DNR] and Environmental Protection Agency - EPA [exit DNR] recommends that pregnant women and those planning to get pregnant not eat swordfish, shark, king mackerel and tilefish because these species contain high levels of mercury. FDA has found that women of childbearing age can safely consume up to 12 ounces of fish per week (2 average meals per week). Wisconsin fish fry typically is cod, haddock, or perch, which are among the safest species of fish to eat. You have little cause for concern if you eat or buy a variety of commercial fish or eat less than one meal per week of fish. Regardless of whether the fish you eat is store-bought or caught from Wisconsin waters, monitor the amount and species of fish you are eating and follow the state's fish consumption advisory to decide which are safest. 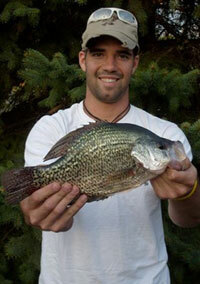 Several Wisconsin sport fish are also commercially caught and sold. See Wisconsin’s advice for Lakes Michigan and Superior, Green Bay and the Mississippi River if you eat purchased fish harvested from these waters. Wisconsin has more than 15,000 lakes and 40,000 miles of rivers. The DNR has been able to test fish from over 1,700 sites since the 1970s, focusing efforts on popular lakes and rivers and those near industrial centers. Because of the large amount of data we've gathered, we know how much mercury is generally found in different fish species. With that information, we determined the consumption advice for how many meals of certain species people can safely eat to reduce their risk of exposure to mercury. In addition, some waters have more restrictive advice due to higher concentrations of mercury or PCBs. The amount of contaminants you would accidentally swallow as a result of swimming in waters contaminated with environmental toxins is insignificant. Ingesting surface waters should be avoided unless first properly treated. Can I eat fish from water containing blue-green algae? Some blue-green algal toxins have been shown to accumulate in the tissues of fish and shellfish, particularly in the viscera (liver, kidney, etc.). Whether or not the accumulation levels are sufficient to pose a risk to humans is uncertain, although it would depend in part on the levels of consumption and on the severity of the blue-green algae blooms where the fish or shellfish were caught or collected. The World Health Organization advises that people who choose to eat fish taken from water where a blue-green algae bloom is present eat such fish in moderation and avoid eating the guts of the fish, where accumulation of toxins may be greatest. Also, take care to not cut into organs when filleting the fish and rinse the fillets with clean water to remove any liquids from the guts or organs before freezing or cooking. Learn more about blue-green algae. Select healthy fish and healthy tissue for cooking and eating. Most diseases that affect fish health have no impact on human health. Fish can be carriers of viruses or bacteria, but may show no signs of disease. Fish that appear normal are safe to eat so long as the fish is properly cooked. Do not eat fish you found dead, decomposing, or that appears sick. Wash your hands after handling fish especially if they are dead or appear diseased. Fish may also have parasites such as worms or grubs or tumors and cysts. Most fish parasites are a normal part of the ecosystem. Fish parasites do not pose a health risk if the fish is thoroughly cooked. The only parasite in Wisconsin fish that is a concern to humans is the broadfish tapeworm and it may live in the muscle of some fish. If you are pickling fish, use a canning method that includes a boiling water bath to ensure that any tapeworms are killed. For more information about preventing the spread of fish diseases, see our fish diseases website . The statewide general advice is not applied as a default to Lakes Superior and Michigan and Green Bay because mercury concentrations are lower in most species. Advice for fish from these waters are based on contaminant concentrations found in fish from those waters rather than the statewide advice. Also, the statewide general advice is not applied as a default to the locations where PCBs concentrations reach the highest levels of concern (parts of the lower Fox, Sheboygan, Cedar and Manitowoc, Milwaukee Rivers systems). Because all species have not been tested, it is not prudent to have the statewide advice as the default at these locations.